One of my Windows Live Messenger installations stop working recently and I spent quite a bit of time trying to repair it. The standard procedure is to uninstall through the Control Panel and then reinstall, but this didnâ€™t work and I kept getting the same error. The application would crash as soon as I would login. I searched the Internet and tried many solutions, but nothing worked. Fortunately, Microsoft posted a solution which details a thorough uninstall of Windows Live Messenger. It involves executing commands from Start->Run and also running commands which delete entries from the registry. The instructions are easy to follow, but may be somewhat intimidating for a novice user. After following these procedures, I was able to reinstall a working copy of Windows Live Messenger. This page can be found at Clean Installation of Windows Live Messenger. 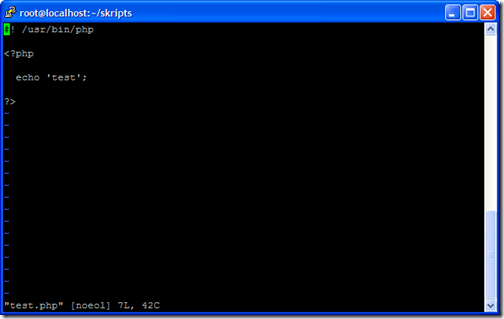 The PHP interpreterâ€™s path can be found by entering which php in the command shell. Unfortunately, this wonâ€™t fix the problem for a PHP document created in Eclipse. 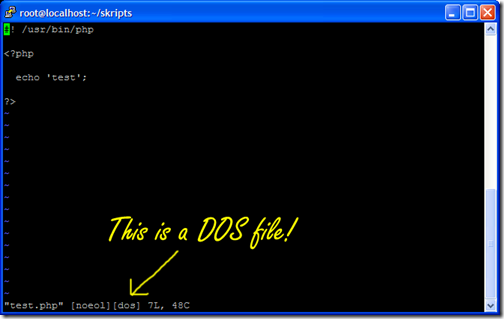 The files are being saved as DOS files which you can see if you open your document with vi (see below). This will convert test.php to a UNIX file type and then it can be executed in the shell. If you view it in vi, the [dos] indicator will not be displayed (see below).